When designing the layout of an irrigation system, no matter the size of the project, the following fundamentals will always apply: pressure, head-to-head and zoning. Once these are taken into account, the chances of installing a system that results in high levels of efficiency are dramatically increased. A proper design matches available pressure and flow rates with the technical specifications of the sprinkler to ensure the system operates within the correct range. The term “head to head” refers to the spacing of sprinklers at their radius. If a sprinkler has a 3-metre radius then they must be spaced at 3m apart to ensure uniform distribution. Modern sprinklers have a distribution profile which is triangular in shape. Depth of application decreases as the spray reaches the outer limits of its radius. If sprinklers are spaced too far apart then some areas will get less water than others. The only way to solve this problem is to run your zone for longer to ensure that the dry patches are sufficiently watered. This causes some areas to be over-watered, drowning plants and wasting water. The correct spacing of sprinklers ensures uniform distribution of water and the most efficient application rate. 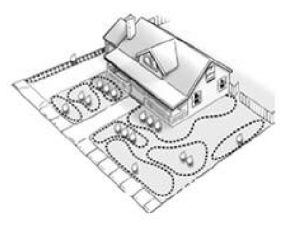 Zoning is the practice of dividing your irrigation system up into discrete “stations” that can be individually controlled to optimise water distribution. Plant water requirements. Turf grass requires different amounts of water to shrubs. Annuals differ from perennials. Exotic plants need more water than indigenous. Each plant type has its own specific watering requirements. Soil types. Sand, loam and clay soils each have different infiltration rates which needs to be taken into account when determining how long to water for. Clay, for example, needs a “run-soak” cycle which puts down small amounts of water at a time to reduce the amount of runoff. Sunny / Shady. Sunny areas experience more evaporation and require more water than shady areas. Typically, the South side of your house will need far less water than the North side. Sprinkler application rates. Different sprinklers apply water at different rates. A typical cone sprinkler has a precipitation rate of 40mm/hr. A rotor can have a precipitation rate of 10mm/hr. If these sprinklers are placed on the same zone there will be sever under/over watering and water wastage. Zoning your system according to these criteria allows you to adjust run times per zone to optimise water usage and ensure your landscape gets just the right amount of water.